When residents and visitors think about California, they associate many things with the Golden State; sunshine, crashing waves, snow-capped mountains and celebrities are a few things that immediately come to mind. Few people would mention tinnitus, but this ringing in the ears is more common in Burbank and other locales throughout the state than you think! Tinnitus effects one out of every five Burbank residents, making it one of the most commonly reported health complaints. It isn’t just a California problem; about 20 percent of the U.S. population experiences it to some degree. To understand what tinnitus is, you should first know what it isn’t: tinnitus isn’t a medical condition but is instead classified as a symptom – the result of another underlying condition or factor. 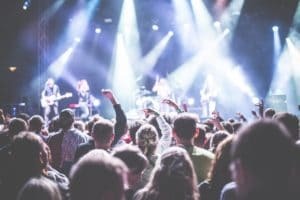 Tinnitus is unique to each individual. For some people it is nothing more than an occasional nuisance, while others find it so bothersome it affects many aspects of their everyday lives. 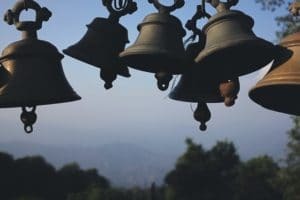 It is most often described as a ringing in the ears, but people have also reported a roaring, whooshing, buzzing, hissing, clicking or whistling sound. Its negative effects include anxiety, stress, depression, fatigue and irritability. There is no cure for tinnitus, but this doesn’t mean people experiencing it in Burbank have no chance of finding relief. Audiologists recommend a number of strategies for managing tinnitus in order to minimize its impact on your daily life. Masking techniques such as white noise therapy and tinnitus retraining therapy seem to help people find the most relief. They work by distracting your brain from the ringing in your ears with other sounds – rain, ocean waves and patterned musical notes are common. Many folks simply turn on an air-conditioner or fan to achieve the same effect. Your Burbank audiologist might also recommend making changes to your diet or lifestyle. In some cases, reducing or eliminating things such as sodium, alcohol and tobacco can lead to a decrease in symptoms. Others swear by natural remedies like gingko-biloba or alternative therapies such as acupuncture, but evidence of their effectiveness is mostly anecdotal. If symptoms are believed to be caused by medications, your doctor may prescribe a different drug to see if that makes a difference. The bottom line is this: when it comes to tinnitus, you are not alone. Contact an audiologist in Burbank today to learn how to quiet the distraction. Airline travel doesn’t exactly rank up there on most people’s lists of favorite activities. Whether you’re flying out of Bob Hope Airport or LAX, you are going to have to contend with traffic on the way there, not to mention security checkpoints, overzealous TSA agents, cramped seating and the possibility of overbooked flights. It’s enough to have anybody seek out Greyhound tickets instead! But bus travel is no picnic either. Sometimes, you have little choice but to fly to your destination. If you have hearing loss in Burbank, that can be even more of a hassle. Hearing loss presents challenges in your everyday life. Traveling only compounds that! While we can’t promise you a turbulence-free experience, the following tips should help ensure a smoother flight. Do some advance planning. Before you even pack your bags, make a list of everything you’ll need so you don’t overlook important items. People with hearing loss in Burbank should include hearing aids (naturally!) as well as accessories such as batteries, cleaning supplies and a travel/storage case. It’s a good idea to schedule a clean-and-check appointment with your audiologist before embarking to ensure your hearing aids are in good working order. We also suggest printing up all important information, such as itineraries, hotel reservations, etc. in case you get separated from traveling companions or experience language difficulties in a foreign country. Inform TSA about your hearing aids. You won’t have to remove your hearing aids when going through security checkpoints – x-ray equipment won’t damage them in any way – but letting TSA personnel know you are wearing hearing aids will reduce the chances of a hard-core pat-down. If you aren’t wearing your hearing aids when passing through the checkpoint, do not place them on the conveyor belt or inside plastic bins – doing so might cause static electricity to discharge, and this could damage your equipment. Take advantage hearing loops. 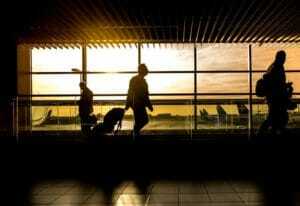 More and more public facilities, including airports, are being outfitted with hearing loops – wire coils that transmit electromagnetic signals directly to your hearing aids. This allows you to hear more clearly over background noise, helping you to get from Point A to Point B more efficiently. To use the system, just turn on the “telecoil” setting on your hearing aids and you’ll be connected. Don’t stow hearing aids in the overhead bin. Your best chances of ensuring a smooth flight, other than avoiding the dreaded middle seat, are to wear your hearing aids the whole time. Don’t worry about turning off these electronic devices and stowing them away; hearing aids will not interfere with the airplane’s communications or controls. Putting them away increases your risk of missing important in-flight announcements or, worse yet, having them disappear. Know your rights. The Air Carrier Access Act of 1986 was passed to provide airline passengers with hearing loss special rights. These include the right to indicate your need for special assistance during the booking process, information that will be added to the passenger manifest and distributed to flight attendants and gate agents; the right to request disability seating, usually located in the front of the aircraft in order to ensure the flight attendants are visible; the right to pre-board; and the right to the same communication access as all other passengers. Exercising these rights will help make your travel experience less stressful. For more information on traveling with hearing loss – whether by air, sea, rail or interstate – talk to your Burbank audiologist. 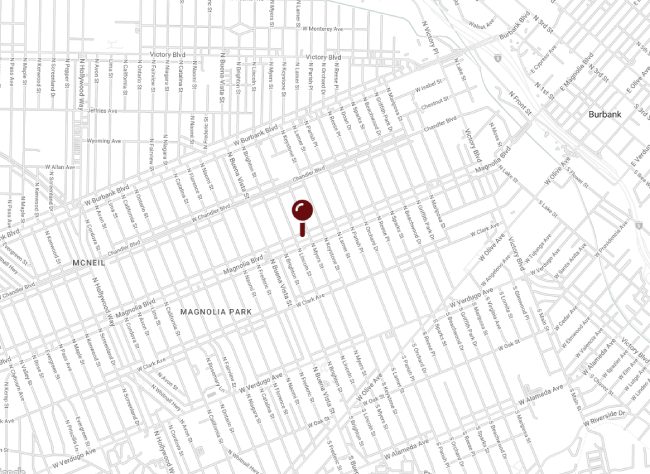 We are celebrating three years in Burbank! Will your ear be the 1000th ear to be fitted for a hearing aid? Dr. Mary Frintner has more than 30 years of experience evaluating and treating hearing loss. She has served hearing impaired patients in the San Fernando Valley, San Gabriel Valley and the Greater Los Angeles communities since 2000. Three years ago, we opened our office in Burbank and we’ve enjoyed every moment. We are so thankful for the way we’ve been embraced by the community and are proud that we have been able to help so many of you on your journey to better hearing. In only three years, we have helped more than 984 ears! Will yours be the 1000th ear to get a hearing aid? Special pricing on Oticon OpnTM hearing aids. Plus receive additional incentives to donate your current hearing aids. 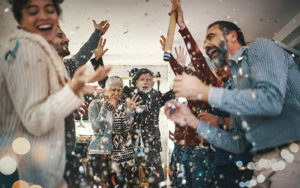 While we’re talking about celebrations, we thought we’d leave you with a few tips on how to enjoy the party with those who have hearing loss. Keep the music low. While music adds to the party, but if it’s too noisy it can prove distracting to those with hearing loss. Include everybody in the conversation. Hearing-impaired guests may act quiet or appear uncomfortable. It’s not that they are antisocial; they may simply be feeling left out. Include them in the conversation as much as possible. Face the person when speaking. Many hard of hearing individuals rely on facial cues and/or lipreading in order to communicate. Face your guest when speaking so they can understand your words more easily. Speak slowly and clearly. Do not mumble and resist the urge to shout. Stick to simple words and phrases delivered in a normal tone of voice. Make sure to avoid speaking while eating and do not cover your mouth with a napkin or your hands. Rephrase rather than repeat. If you’re your friend with hearing loss is having trouble understanding, you’ll be tempted to repeat yourself (and will probably raise your voice to overcompensate). Try rephrasing instead, using a different word that conveys the same meaning. Often, a particular vowel or consonant causes trouble. Don’t hold a conversation from far away. Remaining in close proximity when conversing will ensure they understand what you are saying more easily and allows them to see your mouth and facial expressions. Hearing loss is one of the most common physical health conditions in the U.S. Approximately one out of every five people in Burbank experiences hearing loss to some degree. Most of us are probably aware of the most common causes of hearing loss – but there are others that might surprise you. The top causes of hearing loss in Burbank are natural aging and noise exposure. By the age of 65, one-third of all Californians experiences hearing loss; at age 75, that number climbs to one-half. A lifetime of noise exposure takes its toll, gradually destroying the tiny hair cells in the cochlea responsible for hearing. High frequencies are affected first; as hearing loss progresses, it becomes increasingly difficult to follow conversations, especially when background noise is present. Noise exposure can cause hearing loss at any age. Sounds exceeding 85 decibels can cause permanent hearing damage; the louder the sound, the quicker hearing loss develops. A single loud gunshot, for instance, can cause immediate, irreversible damage. Most adolescents and young adults with hearing loss can blame it on noise. Those are the most common causes of hearing loss. But according to your Burbank audiologist, they aren’t the only ones. Medical conditions. Certain physical health conditions are associated with a higher incidence of hearing loss. Diabetes, for example, doubles your risk of hearing loss, and people with high blood pressure, elevated cholesterol levels and high fever are more likely to suffer from impaired hearing as a result of restricted blood and oxygen flow to the ear, which can permanently damage the hearing nerves. Everyday sounds. Your daily environment is full of potential risk from things you might not even give a second thought. Noisy traffic, with idling engines, horns and sirens, is a constant if you live or work near a busy street. Commuters who use public transportation to get to work must also deal with excessive noise from buses, trains and subways. Even household appliances can cause harm. Hair dryers, dishwashers, vacuum cleaners, garbage disposals and washers/dryers can all be surprisingly noisy. When shopping for appliances, look for decibel ratings of 85 dB or lower – information that should be available in the product manual or website. Music. 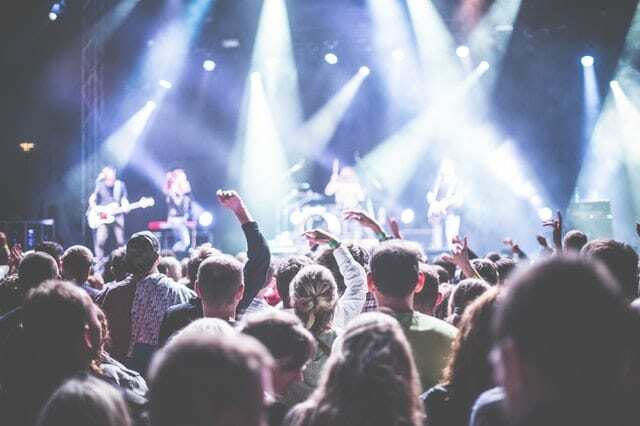 Obviously, concerts are noisy – but you’re probably more likely to put your hearing at risk when listening to music through headphones or earbuds. To preserve your hearing, set the volume to no more than 60 percent of maximum and take frequent breaks to give your ears a rest. Consider investing in noise-cancelling headphones, which block external noise, so you won’t have to turn up the volume in order to hear your favorite jams. Fitness classes such as spinning and aerobics are often accompanied by loud music; toss a pair of earplugs into your gym bag to prevent damage to your ears. Health treatments. Treating a health condition may cause serious side effects like hearing loss. More than 200 medications have been shown to harm your ears, including many commonly-prescribed diuretics, antibiotics and chemotherapy drugs. Even over-the-counter pain relievers such as aspirin and ibuprofen can cause damage at high doses. If you’re displaying signs of hearing loss after taking a new medication, let your doctor know; alternative, less-risky drugs may be available. Other health problems such as ear infections, excess earwax and balance disorders can cause temporary or permanent hearing loss. Seek medical treatment at the first sign of trouble.